Her name, she often jokes, is so hard to pronounce that her followers simply refer to her as ‘The Lady’. Maybe its not that; maybe its because, in Burma, when you say those 2 words – there is only one person you can possibly be talking about. Aung San Suu Kyi. Imagine living, for 21 years, imprisoned in your own house – almost never being allowed outside – all because you believed in democracy. That is what happened to Aung San Suu Kyi (pronounced Awn San Sue Chee). ugh it was spoken only in whispers, and despite all efforts to suppress her – her influence only grew. The whispers turned to roars as her growing supporters began protesting for democracy and asking for her release. She struggled those 21 years, but never gave up hope, changed her stand, or even considered violence. She won the Nobel Peace Prize, and was awarded for her courage by Indian, American, and other governments. 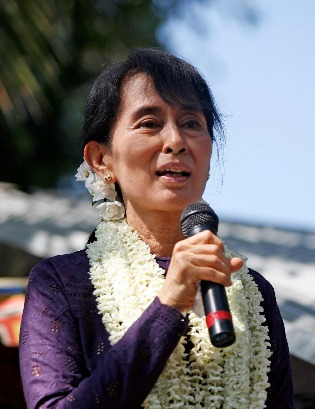 But it doesn’t end there for Aung San Suu Kyi, because her campaign for freedom actually succeeded. She was released in 2010, but released only back into the prison that was autocratic Burma – but she did not give up hope. She immediately legalised and reorganised her political party, who won the elections that occurred that year. Due to her efforts, the military junta dissolved the following year – democracy, change and reform returned to Burma after 50 years. An amazing person.